People love sweet potatoes, but I have never been a fan. I think it is because my only exposure to them was at Thanksgivings, where they were simmered in maple syrup and topped with brown sugar and marshmallows – every dentist’s nightmare. When sweet potatoes are not drowning in sugar, the health benefits are numerous; they are high in vitamins, minerals, and fiber. So, I am trying to incorporate them more in to my diet. This is the recipe from Serious Eats, one of my favorite culinary resources. The article states “Par-cooking the potatoes in water between 135 and 170°F activates an enzyme that converts their starch into maltose, making them extra flavorful and sweet.” The recipe takes 2 hours, but most of it is down time. The potatoes were sweet and creamy, almost soufflé like. I wished for a crispy exterior, but I know that is hard to accomplish with out deep fat frying (again, negating those health benefits). 1. Place sweet potatoes in a large saucepan and cover with water. Heat water to 160°F as registered on an instant read thermometer. Cover and set aside for 1 hour. 2. Meanwhile, adjust oven racks to upper middle and lower middle positions and preheat oven to 400°F. Drain sweet potatoes and transfer to large bowl. Toss with 3 tablespoons olive oil and season to taste with salt and pepper. 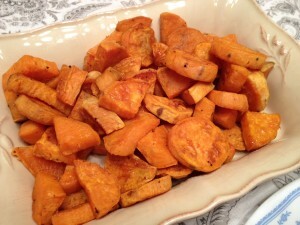 Spread sweet potatoes on two rimmed baking sheets and roast until bottom side is browned, about 30 minutes. Carefully flip potatoes with thin offset spatula and roast until second side is browned and potatoes are tender, about 20 minutes longer. 3. Transfer to a large bowl. Toss with remaining 3 tablespoons olive oil, parsley, and honey. Serve immediately.